The pin is out ! Ok, this week the good doctor took out the final pin from my ring finger. What a painful experience that worked out to be. It's still a little crooked near the nail, a healing hole in the end just under my fingernail, still won't bend very well at the second knuckle because of the stretched tendons and swollen just a little bit near the tip. But, other than that, it's perfect! What a lesson in safety this has been for me with lingering effects on my previously fast typing speed. Since this problem one would note some of my stuff is mispelled.....i.e. the W's, S's and Z's. The nurse asked me if I wanted to keep the pin. What a morbid thought. I'm just about ready to get back to the hobby of making things again. Since the finger problem, I've been thinking a lot about projects, all kinds of projects. I wanted to make another undulating chess table, and an entertainment center, and possibly find more wood for a cypress tree trunk table, maybe with a check large enough to stabilize with a stunningly visual bow-tie or two. Thanks to Dr. Jon DeVries for all the patience and good work of getting me back to less pain. Ok, here we are, and mid December came and went. The doctor only removed one pin from my ring finger; incidently the pin that prevented the rotation, he said. Dr. Jon DeVries refused to remove the second pin due to the lack of bone restoration in and around the last joint of my ring finger. So, here I am, typing along with the final pin almost sticking out the end and the fingernail hankering to come off. If you see too many S's or W's in my ramblings, then just ignore it and try to understand....sss.sssss...ww.... It sure takes a while to heal when you get older.....(sigh). The bigger 30 thousand foot view here is to not let this happen again. If I'd been a little more careful at the time this happened, it wouldn't have....so to speak. Let this be a lesson that you don't have to personally experience. Be careful out there. The older you get the slower you heal, if at all. You don't need to become an accident victim in your wood shop. There are a lot of nice things you can make with this hobby, and cut-off fingers isn't high on the desireable list. BE CAREFUL and use all of your safety gear, all the time. Inasmuch as I hate to admit it, I amputated my ring finger right above the last knuckle back in October. Boy oh boy did that hurt! Lucky for me, Dr Devries, a hand surgeon at the sports injury medical center was able to pin it back on and sew it up to heal. It's been several weeks now and my finger has been healing up and I should be getting the pins removed in mid December. That ought to be another real thrill. But, the moral of this story is that it really should never have happened in the first place. I was cutting a hold-down kerf about 1/4" thru a 3/4" small strip of wood that was to go around the underneath side edge of a chest of drawers, and then it happened. I didn't need the kerf to go the entire length of the board so I eased the middle down on the saw blade, poised 1/4" above the table saw deck. I proceeded to move the board against the blade for a bit and then for some reason, I decided to go the other direction a bit. Well, any good woodworker knows that you don't push wood backward thru a table saw......what a dumb move. Of course when the wood was jerked from my hand by the saw blade, down went my fingers and the ring finger got it. Now I have a healing time to go thru and hope for some resemblance of a finger as a result. The doctor put 2 s/steel pins in it thru the end to hold it together during the healing period. What a pain. Again, the moral of the story......don't do that! Practice safety with your tools....all the time. 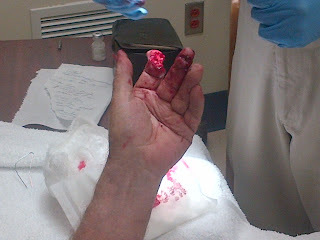 Be careful in the wood working shop - those tools can get you. Hearing protection, Safety glasses, splinter proof gloves, are just the beginning of safety items needed for this hobby. Some of the long term problems you may encounter by not using safety gear may be surprising. Tell me about your experiences with safety in your wood shop.